Bighorn, Other Shape Guitar from Airline. Second in a series of new Airline models slated for 2011 is the Airline Bighorn. This new model draws inspiration from the original Montgomery Wards student guitars of the 1960’s, but is delivered in the form of a modern instrument. It is a full Fender scale length of 25 ½”. The stripped down Bighorn features the Airline Argyle Diamond pickups, 3-way switching, dual volume / tone controls and a fixed adjustable bridge. Its design has a solid basswood body and a maple bolt-on neck with the raised metal Airline logo on the headstock. 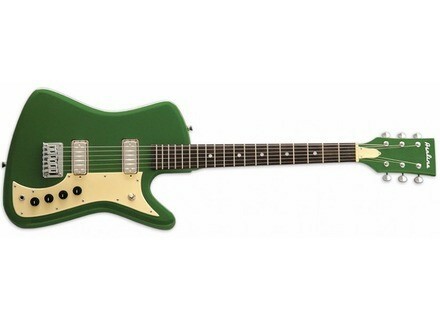 It is available in Green, Red and Sunburst. Deluxe AIRLINE hardshell cases are also available. The Airline Bighorn started shipping in May 2011. Black Mesa Guitars Spectra The Black Mesa Spectra draws on the styling cues of the late '50s and early '60s "when the world stood on the threshold of space and the future was filled with promises of flying cars, personal robots and self-cleaning houses," according to the company. New Firmware Available for Torpedo VB-101 Two Notes introduces a new firmware update for Torpedo VB-101.